Madrid is an eminently urban city, a big jungle of buildings and concrete. The people of Madrid is well aware of this, that is why they know how to enjoy better than any other citizen of other cities their green areas, which are not few and definitely not small. In Madrid’s parks you can enjoy a superb view of the whole city or assist to the open air electronic event – Brunch-in Madrid. You can also rent a rowing boat or appreciate a piece of the recent history that some of the parks contain. So how can we best enjoy the parks in Madrid? La Casa de Campo is the green lung of the capital par excellence. It has an extension of 1722.6 ha, which is five times the extension of New York’s Central Park. So it offers enough place to picnic away from the stress of the city. A plan that we can culminate with a pleasant ride in the cable car that crosses it in a 2.5 kilometers route. And from a picnic to a brunch, as it is called the proposal of electronic music that every Sunday fills the Park Enrique Tierno Galván and where we can listen to the best sessions by the hand of the great DJs like Tiga, Moodymann, Apollonia, etc. A plan that combines music, gastronomy and family atmosphere where even children can participate in the sessions held until midafternoon. 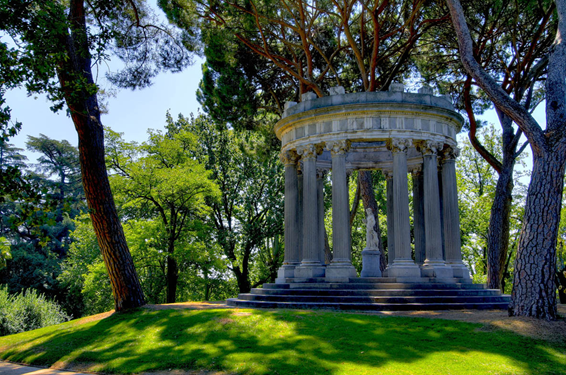 La Casa de Campo may be the city’s green lung, but in the hearts of the people of Madrid the park par excellence is, it has been and will always be El Retiro. With the famous Puerta de Alcalá, the Prado Museum and the Atocha neighborhood as borders, the Retiro contains even more gems inside, such as the Crystal Palace, the monument to the Fallen Angel, the overwhelming forest created in memory of the victims of the terrorist attack of 11M or the Monument to Alfonso XII, next to the mythical pond where you can rent a row boat and spend the morning. The name of this park located in the popular neighborhood of Chamartín, where we also find the Real Madrid FC Stadium, wasn’t chosen randomly. It was built in the sixties in tribute to the German city that had been terribly affected by the construction of the shameful wall that divided the country. The park has other tributes as a monument to Beethoven (born in Bonn, the former capital city in Germany) or the bear, symbol of the city. Once the wall fell in 1989, the central fountain of this park was chosen to contain three pieces as a reminder so no one would forget and repeat the same mistake. Almost in the outskirts of Madrid, near Barajas airport, we find a beautiful park that is well worth the trip to the Alameda de Osuna. It is the gardens of El Capricho: unique and romantic, full of beautiful areas that prove this, as its ornate fountains and corners typical of a palace. It is a park built by order of the Duke of Osuna as a gift to his beloved wife, and as such, is one of the most romantic places in the city, especially if we visit it during fall.